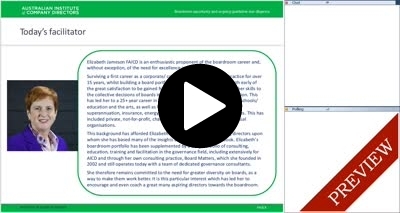 Both before and after you join a board it is important to assess the reputation, culture and other more qualitative factors associated with the board position. The ability to contribute to the work of the board should always be your guiding light for deciding when to join and when to leave a particular board. By the end of this session you should be able to assess the factors that help determine if a board is the right one for you. Elizabeth Jameson has authored the book ‘Developing your Director Career’ available for purchase. Purchase the book and get the five part webinar series for the member price of $300 instead of $445 (32% discount). Email awebinars@aicd.com.au once you have purchased the book to retrieve the ‘promo-code’. Purchase the five part webinar series and receive a 20% discount.